ARPC's Junior Program instructs youth up to 20 years old in firearms safety and good sportsmanship as part of the fundamentals of NRA Smallbore (22 long rifle) Gallery competition. 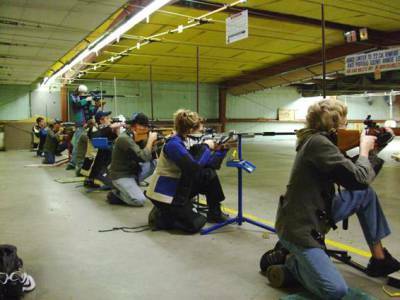 The Club provides bolt-action target rifles, shooting jackets, mats, spotting scopes, ammunition and instruction for the ten-week Saturday-morning sessions each Spring and Fall where they learn to shoot from the standing, kneeling, and prone positions. There is no minimum specified minimum starting age however before participating in the program the young person must be physically capable of holding up the rifle while in the standing position and be mature enough to follow instructions and stay focused. Registration for the Junior Program and Hunter Safety training takes place from 9:00 to 11:00 AM on the first Saturday after New Years Day and the first Saturday after Labor Day. Check the calendar for exact dates and program fee. Both the Junior Program and Hunter Safety Training are open to the public. All juniors must have a signed Junior Consent Form to participate. For additional information, contact the Junior Program Match Director listed on the Contact Information web page.